Space Shuttle Launch Systems 1972 – 2004 is the latest addition to the New Vanguard series (number 99) from Osprey Publishing. · Design and development – The genesis of the Space Transportation System (STS), its painful birth, from prototype to flight, its evolution in the flight era as well as its rivals and proposed replacements. · Operational History – The approach and landing tests, research and development flights, the operational era, return to flight and beyond, the International Space Station, and the ten military missions flown by the STS. · Orbiter Vehicles – Full histories and descriptions of each of the six machines including the origins of their names and missions flown. · Acronyms – Essential reading if you want to understand just what it is that the guys from NASA are saying in their press releases! Everything from ADI (Attitude Direction Indicator) to WSTF (White Sands Test Facility). · Shuttle Mission Numbering System – How the missions were (are still?) numbered and what all the letters and numbers stand for. · Corporate Identities – During the 30 odd years of the STS, the main players in that manufactured it and its systems changed names due to mergers. This chapter explains just "who was who in the zoo" and what they became. The final chapters include Bibliography, the colour plate commentary and the index. The book is well illustrated with 60 color photographs and digital art by Ian Palmer. Of particular practical use is the two-page cut-away of a typical Shuttle stack that shows and names 56 of its key features. The book is the standard Osprey Publishing format of 248 x 184mm and comprises 48 glossy pages between cardboard covers. Osprey's Space Shuttle Launch System 1972-2004 is a great little book. 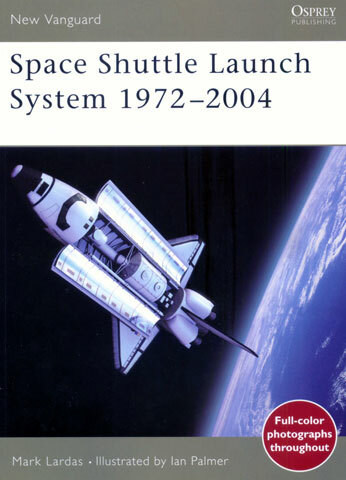 It provides a general run down and understanding of the Shuttle system, where it began, the missions it flew and the histories of the individual machines. If you are contemplating building one of the many Shuttle kits you do well to read this before you start.